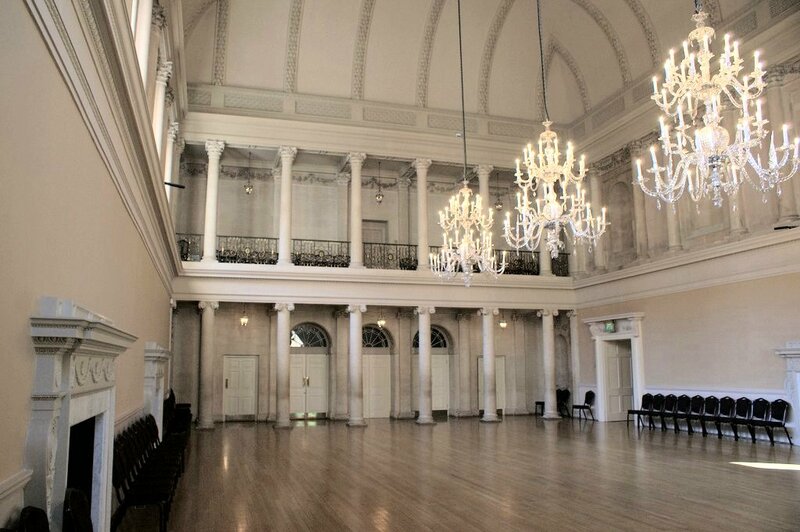 The New Rooms opened in Bath on 30 September 1771 with a combined dance and concert, known as a ridotto. 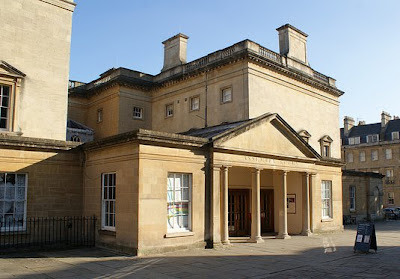 Bath already had two assembly rooms at this date, but these were in the lower part of the town and were proving inadequate for the rapidly increasing population. The New Rooms were built to the north east of the Circus, between Bennett and Alfred Streets, in the fashionable, newly-built, upper town. The New Rooms became known as the Upper Rooms, superior in both facilities and location, whilst the old rooms were henceforth referred to as the Lower Rooms. The architect, John Wood, designed the Upper Rooms and raised the money for their erection by a “tontine” subscription. This was not a regular investment, but contained an element of lottery: as subscribers died, their shares were added to the holdings of the other subscribers, with the last surviving subscriber inheriting the whole. By April 1769, around £14,000 had been raised from 53 individuals and the foundation stone was duly laid on 26 May 1769. 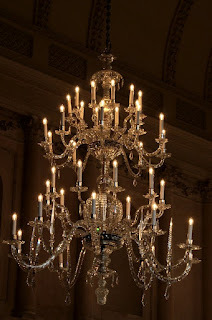 The interior decoration was finished in 1771, ready for the grand opening. The design of the Upper Rooms is essentially U-shaped, with two long rectangular rooms flanking the entrance hall and linked by an octagonal room at the far end. The ball room is over 100 feet long and nearly 45 feet wide, whilst the tea room on the other side is about 70 feet long by 27 feet wide. Beyond the octagonal room is a purpose-built card room which was added in 1777. 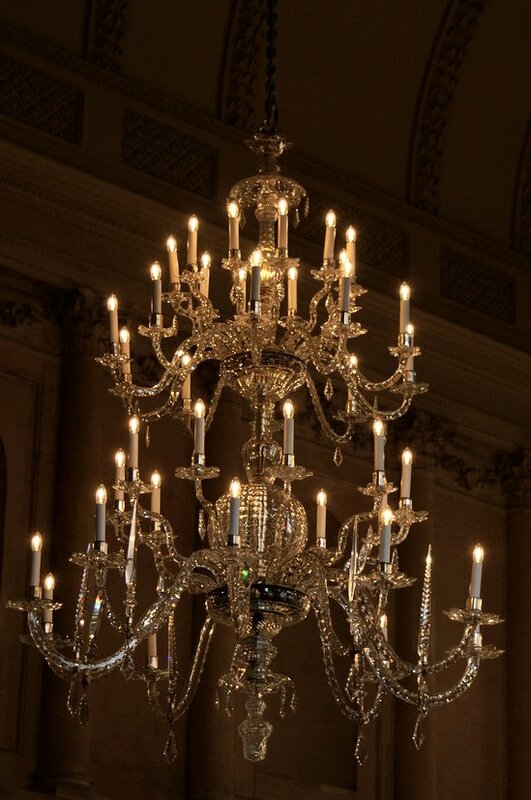 The Rooms were lit by huge cut-glass chandeliers. Bath’s most famous Master of Ceremonies was Richard “Beau” Nash who ruled over the city from 1706 until his death in 1761. Nash’s rules for polite behaviour transformed Bath into the most fashionable watering place in Georgian England. 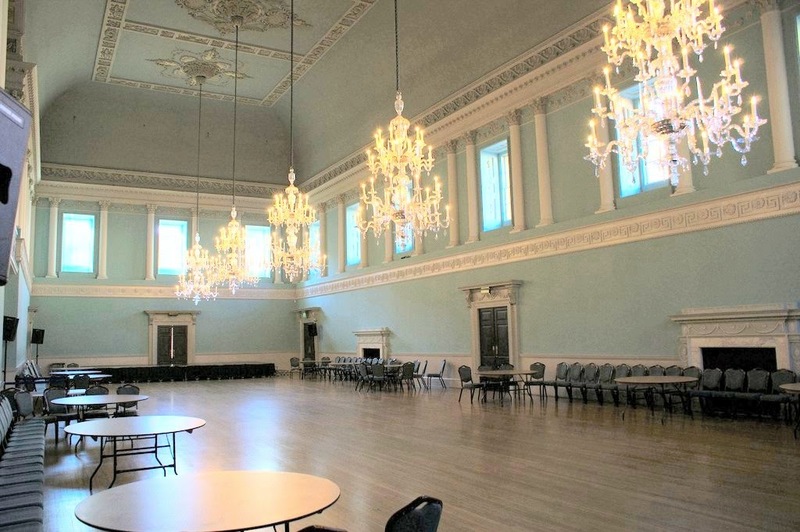 At the time that the New Rooms were built, Captain Wade was Master of Ceremonies, but after his resignation in 1777, the role was fought over by two rival contestants and it was determined to create two Masters of Ceremonies, one over the Upper Rooms and one over the Lower Rooms. 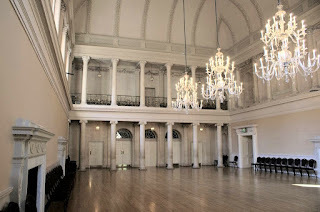 Mr Tyson was Master of Ceremonies at the Upper Rooms from 1785 until 1805 when Mr King was promoted to the role from that of presiding over the Lower Rooms, further confirming the superiority of the Upper Rooms. 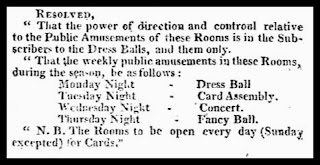 The Bath season ran from October to early June, during which the Upper Rooms held two balls a week, a dress ball on Monday evenings and a fancy ball on Thursdays. The tea room was mainly used for refreshments and concerts. 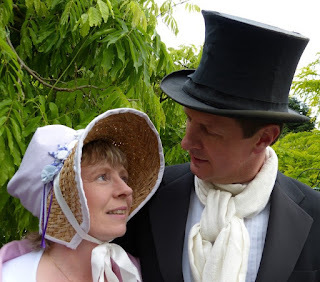 On ball nights, each person was charged an extra sixpence for tea. Public breakfasts could also be ordered by fashionable visitors for their friends here. The favourite drink was tea, served weak and black but sometimes with arrack and lemon. Subscription concerts were held on Wednesday evenings during the season and many leading musicians visited the rooms including Haydn. Gambling was very popular in Georgian society and the Upper Rooms catered for this by providing rooms which were open for card games every day except Sunday. Card playing took place in the octagonal room, and later in the card room. Mr King had particular rules about card playing in the Rooms. These included a rule forbidding anyone from playing with cards left by someone else and another banning hazard and other unlawful games. 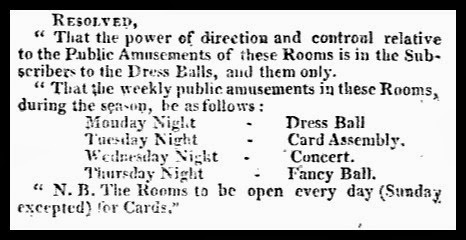 In 1815, gentlemen could purchase a subscription to the card and reading room for the sum of 1 guinea for the year or ½ guinea for two months. The ladies’ subscription for the card assemblies was priced at 5 shillings. The Upper Rooms were given to the National Trust in 1931 and have been home to the Fashion Museum since 1963.